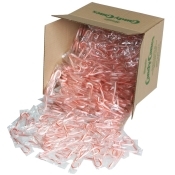 Peppermint flavored Candy Canes are a great holiday treat for your customers. Each 2 1/2" candy cane is individually wrapped to maintain freshness. Packed 500 per case.